Do Elevated Cycletracks Solve Problems or Just Create More? This year, two designs – one proposed and one built – for elevated cycletracks, which create bicycle highways above street level, have gained considerable media attention. They highlight questions at the heart of urban design: Should cities blend or separate transportation options? How can cities best mitigate the hazards created when cars, bikes, mass transit, and pedestrians mix? How can cities create low-cost transportation networks in increasingly dense urban cores? The plan was proposed during a particularly tense time for cycling in London after a spate of traffic accidents in November 2013 resulted in six cyclists killed over a two-week period. But while the project is reportedly backed by the Network Rail and Transport for London, it’s had plenty of criticism. With the costs for just the first 6.5 km trial stretch estimated at a whopping £220 million (approx. 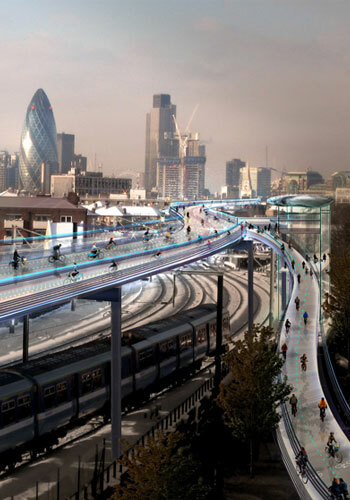 $365 million) and the Mayor’s criticism slowing momentum, SkyCycle’s future is unclear. Actually completed earlier this summer, though, is Copenhagen’s Cykelslangen, or Cycle Snake, which has received widespread critical acclaim. Designed by architects at Dissing and Weitling, the 235-meter (770-feet) long cycletrack curves and winds gracefully over the harbor and one-story above a busy waterfront shopping area. 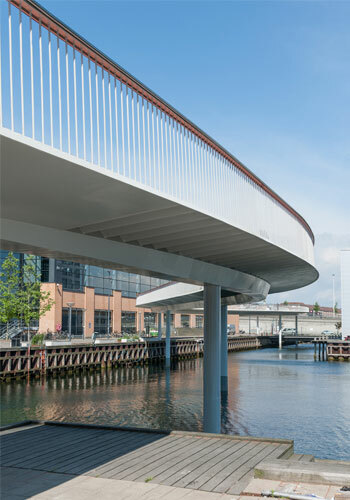 Thirteen-feet wide with two lanes, the elevated bike route connects Bryggebroen pedestrian-bike bridge to parts of the city beyond busy waterfront area Kalvebod Brygge, at a cost of just $5.74 million. Rather than a glitzy panacea to solve a city’s transportation woes on an outdated urban renewal scale, Cycle Snake targeted a specific problem area: a tricky staircase with heavy pedestrian traffic that didn’t mix well with cyclists trying to pass through. The ride offers a nice bit of downhill coasting in a very flat city, and cyclists can enjoy views of the harbor without worrying about crashing into pedestrians. Copenhagen also plans on building six new bike-pedestrian bridges over the harbor. Tourists? Urban bike commuters? Professionals coming in from the suburbs? All of the above? No easy answers, but these designs certainly raise plenty of questions. An interesting look at some of the issues around the idea of elevated cycle tracks in urban areas. On one hand, I can see how the vertical separation might enhance safety. On the other hand, riders would be disconnected from the experience and the amenities of the city. As the article notes, there are no easy answers here, and I have a feeling the debate on this topic is only getting started. If you have any thoughts on this, let me know in the comments. As an urban planner specializing in bike/ped planning I think you got the critique on these two projects perfect. The London project is a billion Pound boondoggle while the Copenhagen project is money well spent. I’ve seen similar bridges to the Copenhagen Cyclesnake built in my mom’s hometown of Bad Kissingen Germany. Those two are incredibly beautiful and wonderfully functional but serve both bikes and peds. Well, on the positive side, grade-separated bike trails like this don’t manufacture intersection conflicts like bike lanes and cycletracks parallel to roads do. It looks pretty safe. On the negative side, bicycling up bridges is such a drag. Ugh! Make the cars do it instead. Really, if you’re going to separate cars and bikes, shove the cars off surface streets and onto segregated freeways like this. As noble as the intentions may be, squeezing bikes out of the way onto inconvenient facilities (like this) or dangerous facilities (like most bike lanes and cycletracks) perpetuates the dominance of motor vehicles. Also, as things currently stand, cyclists are more likely to stop and shop in local stores on their route than motorists. This would end that, taking away business from local stores. On the other hand, after a few more thoughts, this would provide an improvement in convenience for commuters to and from popular locations during rush hour, if not during the day. I guess I’d rather bike up a hill than wait behind hundreds of cars. The disconnect from surface life and businesses still stands, but this would be no worse in that regard than public transit, which I certainly support. So: not as bad as my first impression suggested. Wouldn’t it be cheaper and less cluttered-looking to achieve the same goal by blocking off an existing street from motorized traffic, though? This is a horrible idea. Elevated travel paths have been shown time and time again to cause massive fiscal decay and social deterioration throughout the world. Just look at San Francisco, or New York and you can see all but a very few of the elevated transportation arteries are gone. Jane Jacobs fought long and hard against these major intrusions into the urban fabric. What if you are riding along and see a handmade sweater from 25 feet up in the air going 25 miles an hour, do you just stop and park your bike? And to Julia’s comment that this is just like mass public transit: In most cases, it’s the complete opposite. Mass transit has predefined stops and carries large numbers of people very quickly long distances. Bikes are portable devices that can go anywhere fairly easily. It really doesn’t seem to be that complicated. Make protected lanes that are wide and separated from moving traffic. The width one of those piers would probably do fairly nicely.